In my opinion, we must flee the suffering of samsara—the very thing we are seeking to eliminate—and gather incalculable accumulations to achieve the result, perfect buddhahood. We should practice whatever is said to have the greatest merit. When selling something like woolen cloth, if we give the buyer an extra four or five pounds without them knowing it, this will bring great merit. 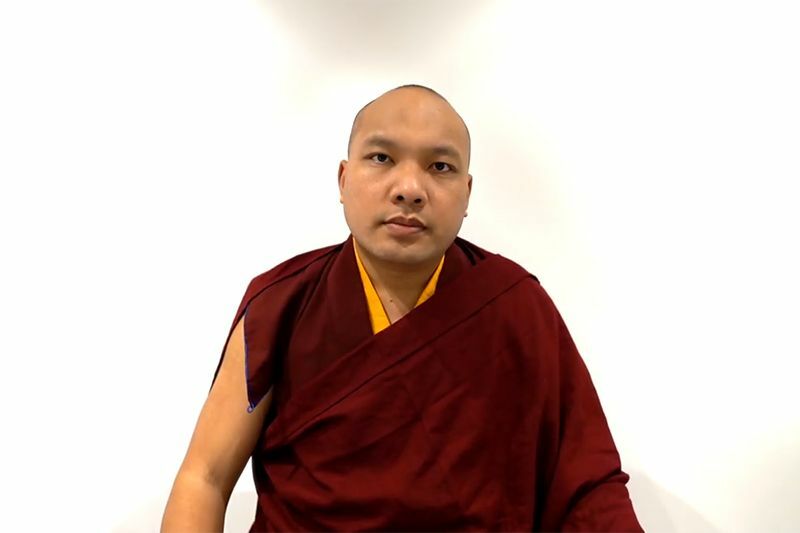 The Karmapa commented that we need to put as much distance as possible between ourselves and the world of samsara so that we can end our suffering. Until now, we have experienced misery even though we wanted to avoid it. Who is fooling us? The culprit is our own mind and its attachment the pleasures and tasks of this life. It is our fixation on this lifetime that is to blame. An analogy for the situation is a fishing line with a sharp, metal barb at the end, and we are the fish hooked by these pleasurable objects we find in this life. This attachment will only pull us into another rebirth in samsara with all of its suffering. As an aside, the Karmapa remarked that some people say they have given up on this life, but if we examine well, we can see that it is not true. Someone might take robes to gain respect, but they do not develop the qualities that would earn it, so they give up being a monk, grow their hair long, and wear a yogi’s clothes, advertising themselves as someone living the simple life. Such people are found everywhere and their search for respect is a sign that they have not yet turned away from this life. 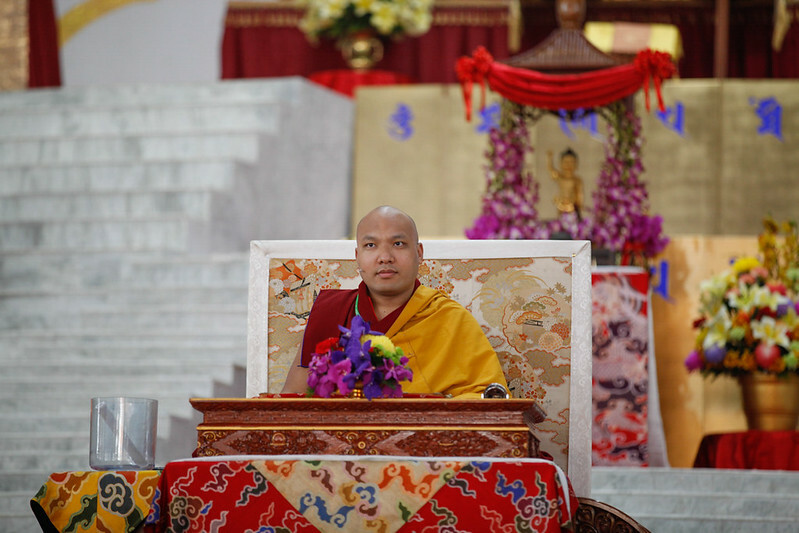 After indicating what needs to be given up, the Karmapa turned to what should be taken up: a vast accumulation of merit, necessary to achieve full awakening. It should happen quickly so that we can begin as soon as possible to help others. How we might do this Potowa illustrates with the example of someone selling woolen cloth. If we gave the buyer an extra four or five pounds without letting them know, that would gather great merit. When I say this, others reply that this is taking a loss without receiving anything in return. It would be better to give it away, they say. Actually, Dharma practitioners should not want anything in return and take delight when others, who are like their parents, win instead of themselves. 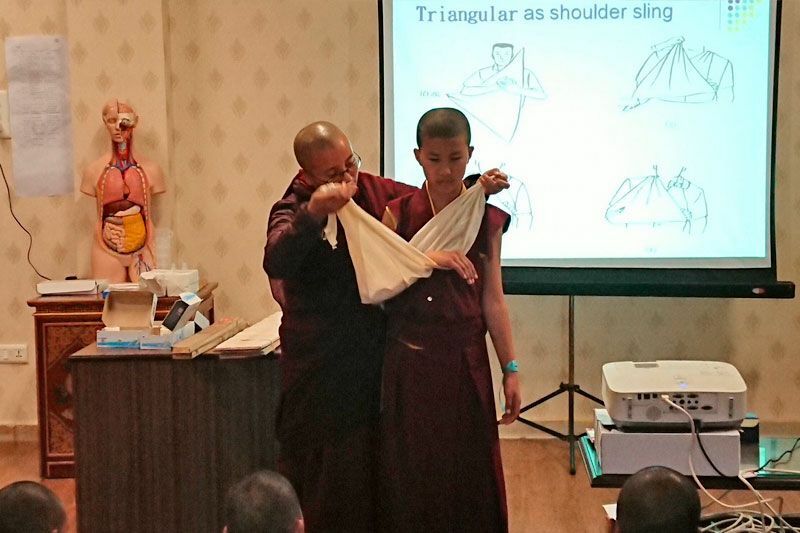 If practitioners are not like this, it will be impossible for them to awaken to buddhahood. Further, [this attitude of seeking something in return] is the opposite of meditating on the Four Immeasurables. The Karmapa commented that if we were secretly generous, others would think we were a complete idiot. Such behavior is pointless, they say, since we lose and get nothing in return. At least if we let them know of our generosity, they would be grateful. Potowa replies that if you think only of this lifetime, then it is as you say. But if you are a true practitioner, you have no expectation of a reward for your activities. You seek nothing in return. For example, if parents have a beloved son, they would wish for him to come out on top. It would be more important for things to go well for their son than for themselves. It is similar for those who seek enlightenment: They prefer that others gain merit rather than themselves. It is this attitude that we need to develop and not just for those close to us but for all the infinite numbers of living beings, whether friend or enemy. Without this motivation, it is impossible to attain buddhahood. We might repeat the first two Immeasurables—May all beings have happiness and its causes. May they all be free of suffering and its causes—but we are just mouthing the words; what we think and what we say are in sync. To achieve buddhahood, we should be capable of giving away even our body and life if it would benefit others, not to mention our possessions. If a “practitioner” loses nights of sleep over a small business loss, not only are they unable to help others, they are also harming themselves. For example, when one morning, someone offers tea to the monks in a remote valley, others might say that this person has gained merit, and the individual as well will think they have done something virtuous. But then this person stays in a well-populated valley or monastery, buying when goods are plentiful and selling when they are scarce. They neither sell at the going rates nor use the accepted measures, such as quarts and ounces. Until they achieve their wishes, they keep on pushing, not giving up until their own hopes are fulfilled and others are left powerless and miserable. This is not just one or two people, but many beings in the ten directions; it is not just for one day, month, or year but for their whole lives. In brief, they feel good if they do something virtuous for one morning but do not feel a moment’s discomfort for spending their entire lives accumulating misdeeds. I wonder what kind of a mind they have. What assurance could they know? The Karmapa commented that if we wish to help others, we should be ready to give not only our possessions and wealth but also our very life if there is good reason to do so. This trader, however, is distressed by losing half of the load from their pack animal. 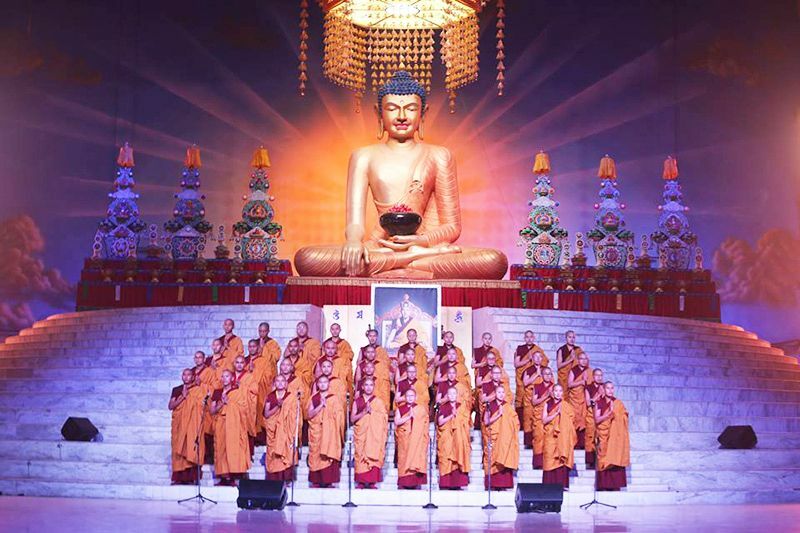 How could such a person achieve buddhahood? They are like a hollow dummy that has been stuffed. On the outside they look like something but on the inside there is nothing of value. That sort of person, the Karmapa observed, could be called a lama, khenpo, master, and so forth, but these titles are just an outer show with nothing behind. Temporarily they might get some profit from this ruse, but in the end, they will know a great loss. In a village where people have gathered, one person offers breakfast to the monks living in one valley. Others will look at this and think that this sponsor has gathered considerable merit, and the individual will also think they have done a good thing and even boast of what they have done, promising to continue in the future. Then they go to a place where goods are plentiful, securing them at a cheap price only to sell them later at a huge profit when things are scarce. They do not follow the accepted local prices, but insist on their inflated figures, and use all kinds of clever reasons to get what they want, making people miserable. 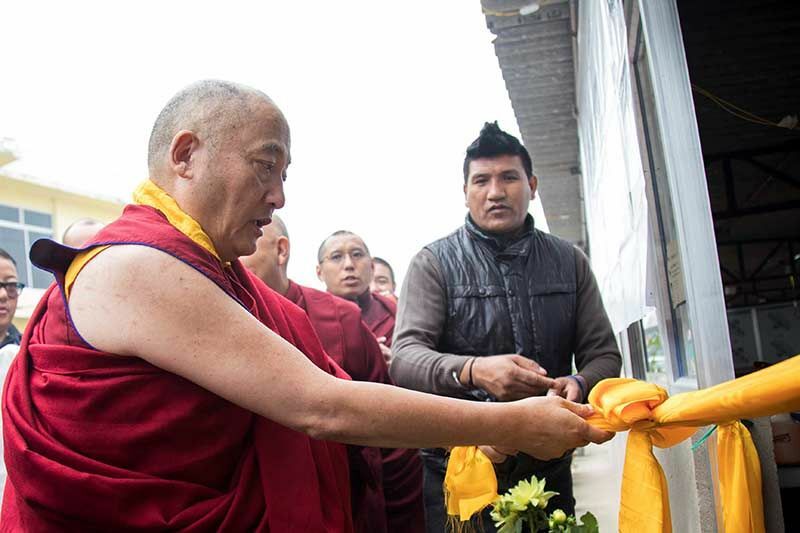 Then they say to themselves, “I’m not doing this for myself but for the benefit of the lamas and the monasteries.” It is not just one person who does this but many, and they do it not just for one day, but a whole lifetime. This is not a good way to live. Similarly some people do some practice and prayers in the morning and feel good about it but then they engage in misdeeds for the rest of the day or the rest of their lives without feeling any remorse. One has to wonder what is in their hearts. What sort of mind do these people have? What sort of assurance about the future can they have? Considering how they have come under the control of ego-clinging and desire, there’s no need to speak of them being liberated by seeing that their misdeeds have no inherent existence. In the first place, they haven’t even heard that in the next life, misdeeds ripen as rebirth in the three lower realms. Even if they have heard, they do not think about it. Instead, without shrinking from ill repute in this life and suffering in the next, they are able to sacrifice everything—their body, life, and Dharma—if it seems they might gain some wealth. They deserve our compassion for this is the epitome of being drowning in the causes of suffering. The Karmapa commented that at the time of Geshe Potowa (1027-1105) and the time of Mikyö Dorje (1507-1554), there were many titles for Dharma practitioners: Chöje (Lord of Dharma), Drupthop (Realized Master or Siddha), Jetsun (Lord), Kunkhyen (Omniscient) and Gyalwang (the Lord of Victors). The Karmapa made a distinction between two other titles: a reincarnation (kukye or yangsi) and an emanation (tulku) of body, speech, and/or mind. 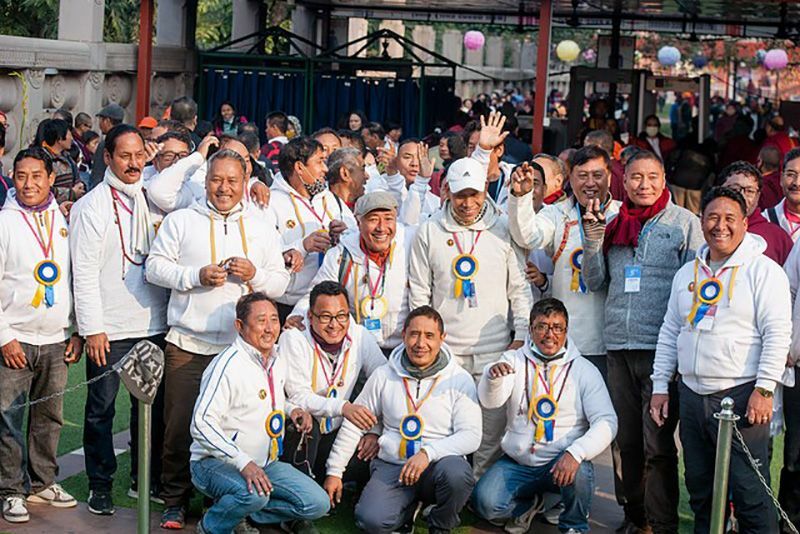 There are also titles for scholars, such as Pandita (a scholar) or Rabjampa (person of profound learning), or they are named by what they have learned by heart—a scholar who has memorized 300,000 stanzas or even a scholar who has memorized 3 million stanzas. There were many names to be given. Nevertheless, no matter what title people might use, if we look at how much ego-clinging they have and how much they take things to be real, there is no chance they will be liberated by seeing that things do not truly exist and that misdeeds are empty. In the first place, they have not even heard that misdeeds ripen as rebirth in the three lower realms. Or if they had heard it, they do not think about it. On this cautionary note, the Karmapa ended his talk for the morning. It was followed by meditation on the sound of a bowl gong. The Karmapa asked people to meditate continuously on the sound as it grew larger, and then as it diminished, to see now the mind become increasingly subtle. Afterward, the Karmapa explained that when he recites the dedications for the living and those passed away (from the collected works of the First Karmapa), he is acting as the representative of everyone, so we should all hold in mind the same prayer, wishing that all beings, as great in number as space is vast, and in particular all those connected to the Kagyu Monlam, have happiness and joy; that the living experience auspiciousness and those passed away find a good rebirth.